So what’s the anatomy of UniPay payment solution? 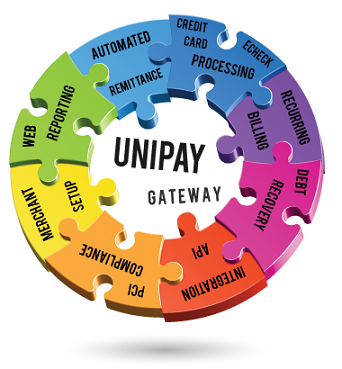 UniPay payment gateway is a highly robust, enterprise-scale open source payment processing solution and payment flow orchestration engine, designed to serve not only as a payment processing or recurring billing system, but also as a relationship management and merchant management platform. UniPay is designed to accommodate equally well needs of small merchants with a single merchant account, large merchants with multiple accounts and multi-merchant businesses with numerous merchants, resellers and associated merchant accounts. It is also a preferred payment solution of numerous ISOs and payment service providers (PSPs). With UniPay software solution you get a complete payment system that helps you handle the entire payment management cycle from the moment payment information is initially captured, until either successful payment settlement or credit bureau debt reporting. UniPay payment solution incorporates over 10 years of operational experience in electronic payment processing, recurring billing and collections industries and combines it with the newest enterprise-scale, cluster-ready technologies. It is used by large and medium-sized companies with great success. Each module’s features are tailored towards needs of a specific industry segment. So what can UniPay payment solution do for you? Let’s find out! So what's the anatomy of UniPay payment solution? Read about the complete set of payment processing features offered by our enterprise ready, scalable, flexible and robust, open source payment solution.